You know how lots of websites have one of those generic 'Contact Us' forms where you fill in a bunch of required fields and then write your message into the little box required? I've, in the absence of any other means of contact, used them on odd occasions and, once in a blue moon, I've actually received a reply. 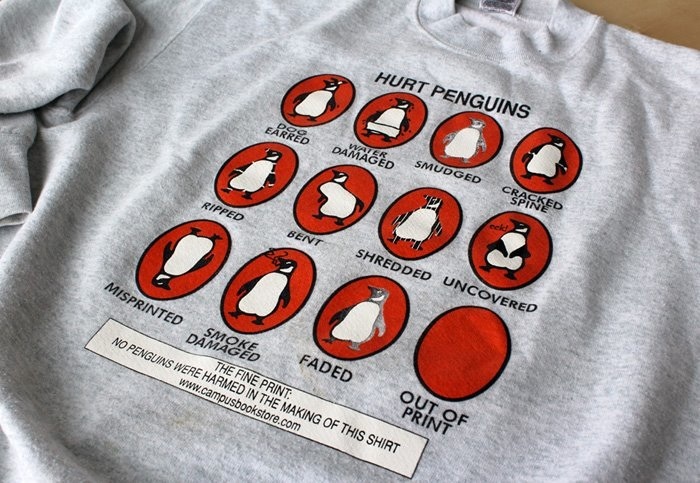 However, I don't think I've ever had such a nice reply as the one that came from Andrew, a one of the customer support staff at Abe Books, where I enquired about the Penguin t-shirt; which is, apparently a sweatshirt - even better...now I really, really want one! 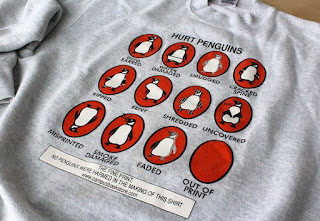 Apart from being ironically amused by being told that the sweatshirt was 'out of print', my reaction was...well, probably I shouldn't print it! Anyway, I did a bit more research about Campus Bookstore. It's at Queen's University, in the Kingston, Ontario*. So, to my North American followers: do any of you know this place? Maybe they can provide some more information. Can we hunt down a sweatshirt or two...given that we know I want one, and Peter (see comment on previous post) wants one too, and I guess, eventually, we're all going to have to have them...! ﻿*Edited after further helpful communication from Andrew at Abe Books - thanks Andrew! Any luck with finding it yet? I'm another who would REALLY love it!! Sadly, no - it was a limited edition thing that's not been repeated.